How was your weekend? It was a mighty productive one in the TBS household, although our internet is still out. The earliest we'll get it back is Wednesday which means it will have been a week without home WiFi! #bloggerproblems It's a double-edged sword, because I can't go online, but I have had time to do other things like clean the bathrooms, vacuum, read, and paint at a really fun blogger meet-up (more on that later)! Our lack of internet has also made me more present at home. For all you bloggers, I know most of you have run into this problem at some point. Blogging takes a lot of time! Brainstorming, reading your favorites, writing and scheduling posts in advance, and social media -- it's a lot of stuff to do. So it's been nice to set aside all e-mails, blogging, and mindless internet surfing to spend more time with my love! Speaking of love, I'm so excited to have my new friend Elisabeth here to share some things about love! On her blog, La Vita e Bella, she writes about her personal life and her marriage, and she really has such a sweet heart. It also doesn't hurt that she's gorgeous! Read what she has to share about laws of attraction below and then be sure to check out her blog. Be sure to tell her that I sent you! I’m Elisabeth from La Vita e Bella. :) Over there I blog about love and life, which to me are pretty much one and the same. Today, I’m so excited to be taking over for Lindsay today and sharing some interesting research on a favorite subject of mine, attraction! My husband Ben and I last summer, the day before our wedding, in Kennebunkport, ME. Fact: While many individuals occasionally feel attracted to ‘opposites,’ attractions between opposites often do not develop into serious intimate relationships. When they do, these relationships often end prematurely. Fact: Individuals who take the time to get to know each other’s personalities before they get romantically involved - in contrast to those who become romantically involved relatively quickly end up with a partner with a more similar personality. What this Means: Wait. It doesn’t mean you can’t kiss him till over the altar, but if you focus on getting to know your beau and taking all the wonderful physical stuff slowly, you’ll end up dating someone with a more similar personality, which will mean a longer lasting relationship. On the marriage prowl? Take it slow. Fact: People like their partners better if they know their partner also likes them. Consciously, you like people who like you. What this means: If you like someone, TELL THEM! or at least give them a hint - they’ll like you more if they have some indication you might be interested. What do you think? In your experience, do they hold true? Other ideas that explain attraction in your life? That's good food for thought! I agree that, ultimately, relationships based on the same values are made to last. I know that Mr. TBS and I may have different taste in music, and he doesn't like musical theatre although I love it, but we aim to live our lives with the same gratitude, respect, energy, love, fun, and morals. What do you think? 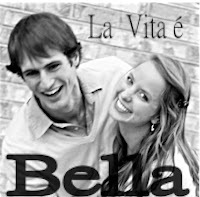 Check out La Vita e Bella and show her some love! Thank you so much for being my first guest blogger, Elisabeth! Happy Monday! Make today great! This is a really interesting blog post ... the laws of attraction have always intrigued me ... like how certain couples look alike. Are we attracted to people who look like us? Heading over to Elisabeth's blog to read more! Thanks so much for letting me steal your adorable blog for the day Lindsay! Great post! Very thought provoking! I can think of several couples who fall perfectly into these "laws" and others who are crazy exceptions... chemistry either in a beaker or a body is just such a crazy thing!! Great post Elizabeth! I think the laws of attraction are really interesting. And, yes, in my experience they do hold true. Thanks for sharing!